UPDATE 12/1/2013: Wisconsin finished the regular season at 9-3 (the most likely outcome according to the original prediction). They lost the two games that they were probabilistic underdogs in and they dropped another game that they were probabilistic favorites in (as was implicitly predicted by the calculation). A couple of years ago I wrote a program that takes, as input, the probability of winning each game on a sports team’s schedule and it calculates the probability distribution for every possible regular season outcome. I used it before the 2011 Wisconsin football season and predicted that 10-2 was the most likely final regular season record. Wisconsin did end of finishing the 2011 regular season at 10-2. I did not make a prediction before the 2012 season. I like this approach because it allows for the expression of confidence (uncertainty) in the prediction of each game. Thus it is better than the straight win-loss predictions, which will tend to be biased toward predicting better records for good teams (more on that below). The program requires a percent chance of winning each match-up as input and it calculates the probability distribution based on basic probability theory. 9-3 comes out as the most likely regular season record (27% chance), followed closely by 8-4 (26% chance). This would imply that it is more-than-likely that UW will finish with between 8 and 9 regular season wins (53% chance). 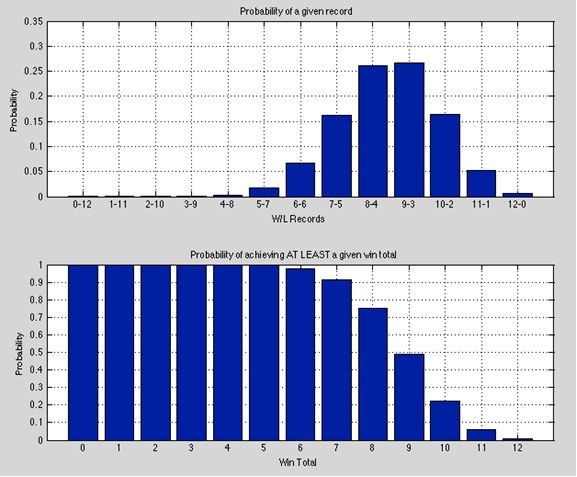 According to my assumed individual game probabilities, there is only a 0.6% chance of UW going undefeated. Now, lets return to a point I brought up above. I said that straight win-loss predictions are biased toward predicting better records than will actually be achieved for teams like Wisconsin (teams likely to win most of their games). This is apparent when you compare my assumed game-by-game percentages to the probability distribution in the above graph. From my assumed percentages, UW is the favorite in 10 games and is an underdog in 2 games, so shouldn’t the most likely record be 10-2? No. The simple reason is that there is a higher chance that UW will lose at least 1 game that they are supposed to win than there is a chance that they will win a game that they are supposed to lose. Part of the reason for this is that there are MORE games that UW is supposed to win than games they are supposed to lose. I think the best way to think about this apparent contradiction is through an analogy: Suppose that a basketball player shoots free throws at 60%. Now lets say that they are about to attempt 10 free throws. How many free throws do you expect them to make? Most people would say 6, and that is the correct answer. But think about it – every time they shoot they have a better chance of making the free throw than missing. Based on this logic, shouldn’t you predict that they would make 10 out of 10 free throws? The answer is no and the reasoning is the same as above. There is more of a chance that the shooter will miss several free throws that they are supposed to make than there is a chance that they will make a free throw that they are supposed to miss (0 in this example). If one of the losses is against MN, I’ll be a happy camper.